This apparatus is easy to use, reliable, and provides accurate results. Wind the nylon band several times around the aluminum cylinder and hang a large weight, such as a can of sand, on one end. When you turn the crank to raise the weight, cord slippage creates frictional heat. Students calculate the work done and read the temperature change to find the heat produced. 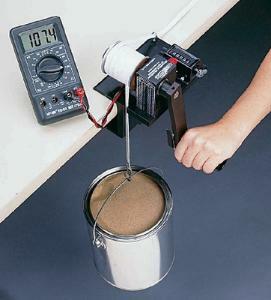 A calibration chart is provided to convert thermistor voltage to temperature. The apparatus features ball-bearing construction, an industrial-grade revolution counter, a built-in friction pad, and guides for the friction rope for an easier first set-up. It also includes instructions and a can for holding mass.